Presidential Spokesperson, George Charamba addresses the media at State House, Harare. The government says it will shut down the internet again in the event that there are more violent protests which "threaten the security of the country." Presidential spokesperson, George Charamba, made the remarks Wednesday morning on a local radio program where he said internet shut down is necessary in the event of violent protests as was the case two weeks ago as investors need peace than the internet. Said Charamba, "It's standard practice when we have a disturbance, the service (internet) can be temporarily shut down." Asked on whether the would-be investors would need the internet or not when they come to Zimbabwe, Charamba said, "Yes they do, but above all they need peace. And that's the primary consideration. After all, why are we trading peace for internet?" He further alleged that during President Emmerson Mnangagwa's four Eurasia tour, he met investors who were concerned about the security of their investments rather than the internet. "On Friday we met a Belgian investor who said Mr President, I don't put my money in a country which is unstable, where law and order are not assured. I look at the authority of the state, can it secure my investments. I look at the judiciary, can it arbitrate in the event of difficulties. "I look at the general work environment and say can my works work and go back home to come again. So really, let's not overdramatize false arguments, to think that investors come here for the internet. 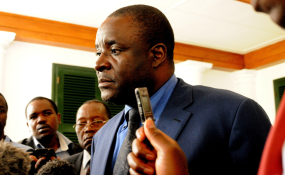 They have better internet services in their own countries," Charamba stated. During the week-long violent protests which left more than a dozen people dead, the government forced internet service providers to shut down the internet and in an effort to curb the spread of army heavy-handedness on civilians. The government also directed that WhatsApp, Twitter, Facebook and YouTube be closed during the skirmishes. Service was only restored after a High Court ruling which ordered the restoration of the internet.